PROPERTY DESCRIPTION: 521.6+- acres located in the heart of the scenic Flint Hills of Greenwood County, Kansas. 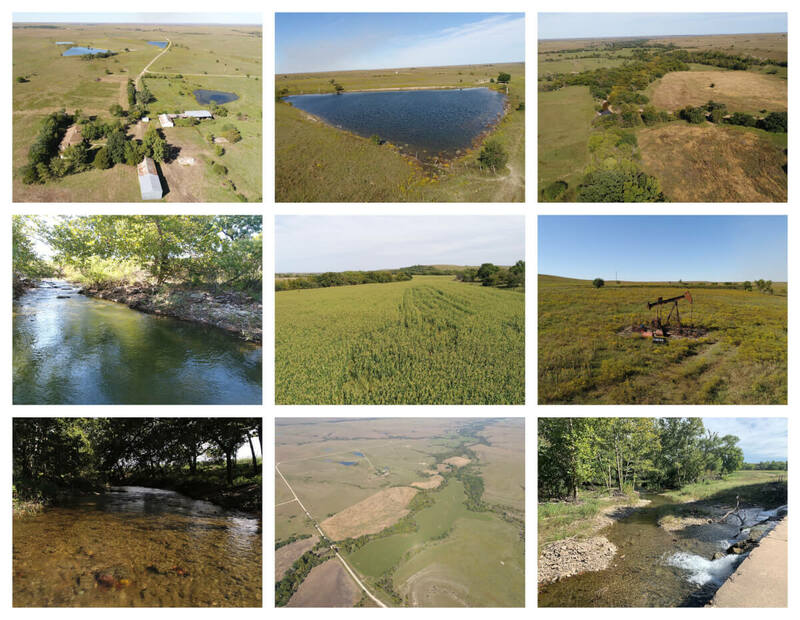 This property has rolling native Flint Hills pasture, large elevation changes with heavy timber covered hills, creek bottom tillable, and improvements. Two branches of Ivanpah Creek meet on the property, offering crystal clear spring water for livestock, wildlife, and fishing. Additional water is provided by a total of 5 ponds, 2 of which are good large clear water fishing ponds. There is an old homestead on the property, several utility buildings for storage, and pipe pens for livestock. HISTORY & OPINION: The 5 mile drive from HWY 54 to the property is one of the most scenic and beautiful drives through the heart of the Greenwood County Kansas Flint Hills. This ranch is in the valley just east of the 2014 & 2018 site for Symphony in the Flint Hills. Directly across the road from the entrance to the Ranch sits the Ivanpah native Limestone School Building. Here is a recent article about the history of Ivanpah. One interesting note in the article refers to the Paiute term Ivanpah, meaning “Clear Water”. That certainly describes Ivanpah Creek, which runs for nearly a mile through the Ranch. OIL PRODUCTION: Landowner income for 2016-$4013.50, 2017-4335.30, 2018 through September-4894.19. LEGAL DESCRIPTION: The West 114 acres of the Southeast Quarter; the West Half of the Northeast Quarter (W/2 NE/4); and the West Half (W/2) of Section 11, Township 25 South, Range 8 East of the 6th PM, Greenwood County, Kansas. 2017 REAL ESTATE TAXES: $1989.90. LAND LOCATION: From HWY 54 in western Greenwood County, North on B Rd (Salyard Rd) 5 Miles. TERMS: Earnest money is $100,000 down at the conclusion of the Auction with the balance due upon Sellers submission of merchantable title and closing. Closing date shall be on or before December 3, 2018. Closing fee and title Insurance fee will be split 50/50 between Seller and Buyer. Selling subject to easements, restrictions, roadways and rights of way. This property is not selling subject to financing or inspections. Interested buyers need to view the property prior to the date of the auction and have financing available and any inspections performed prior to bidding. All pertinent information is available upon request. All announcements made the day of the auction take precedence over any other announcements or printed material. 100+- acres of the Ranch is leased for cattle until March 1, 2019.